Baiju Devaraj’s Sandras Communications coming back with Arundhathi serial on flowers tv from this monday, 1st January 2018. It’s handling a family subject, story of an NRI Jayakrishnan. He is coming back to his hometown to see wife and children. Arundati is the wife of Jayakrishnan, Malu and Appu are the children. Arundhati goes missing on the day of Jayakrishnan’s arrival and this family soap revolving the mystery behind Arundati’s disappearance. Leading mini screen artists are appearing in this serial, we will soon update the cast and crew. Flowers tv changing the telecast time of Mamankam serial to 10.00 P.M slot, you can check the updated prime time program schedule of the channel from here. Parishudhan is recently started ion flowers and it’s airing every monday to friday at 6.00 P.m slot. 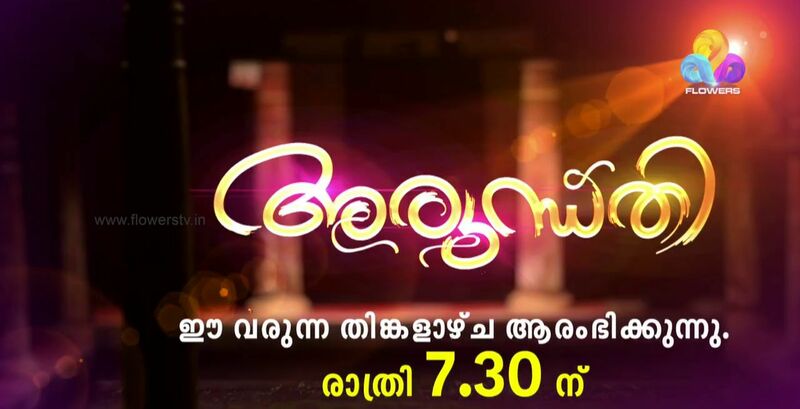 Seetha airing at 6.30 p.m and Malarvadi coming after this at 7.00 p.m. Flowers tv popular show Uppum Mulakum completed 500+ episodes and showing at 8.00 p.m. channel is planning to launch more fresh and interactive content. we will update about those shows here very soon. Latest episode of this serial and other flowers channel shows available through official youtube channel and application. it’s crossed 220 successful episodes on the channel, getting decent trp ratings. comedy supernite skits, comedy utsavam, top singer etc are the prime time programs of the channel. all these getting good ratings at trp charts. stay tuned here for more updates about flowers channel and other malayalam media.